that easy. It's known as playing the game. This is not a game of the blind lead the blind. almost bright enough to blind. With Richter, you could easily stay with those surfaces, passing over the strategies, the troubling questions he places there. Maybe it's best not to look too hard; the wizard past the curtain is no bumbling cut-price medicine man. 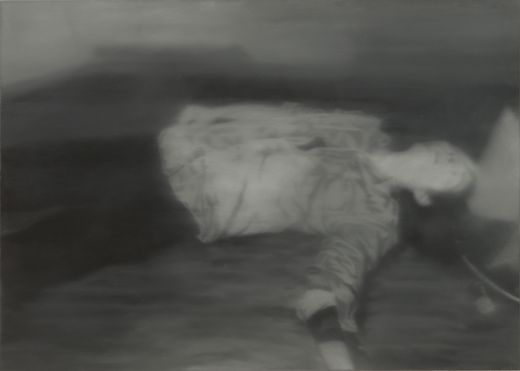 Those two "political" paintings might at first seem anomalous in the larger context of Richter's work. Then again -- maybe not. "Political" typically connotes 'Hot". 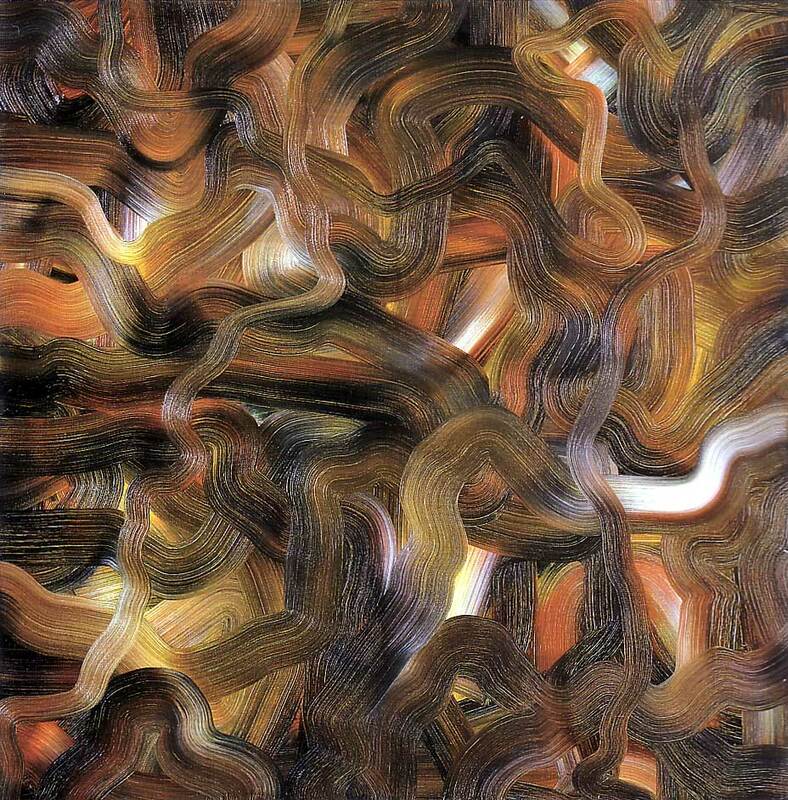 But Richter is not so much a "cool" painter as a cold one. Those two paintings are about as cold as art can get, this side of a morgue or mausoleum. 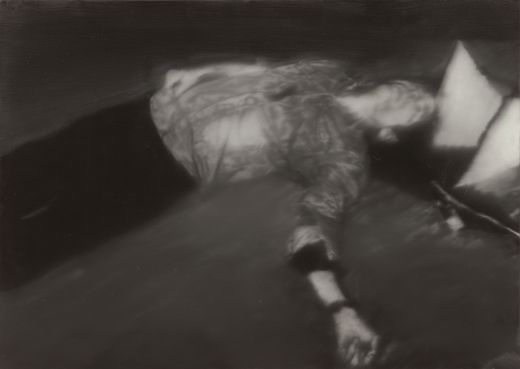 "The two Gerhard Richter paintings entitled Man Shot Down 1 and 2 depict the dead Andreas Baader, who was arrested as a co-founder of the terrorist organisation Red Army Faction (RAF) in June 1972. The pictures are based on police photographs capturing the circumstances after the discovery of the RAF suicides in Stuttgart-Stammheim prison on 18th October 1977. "Andreas Baader, lying diagonally on the floor, fills the landscape-format canvas of Man Shot Down 1. While his right arm lies against his body, his left arm is splayed out to one side. Baader's neck appears overextended, his mouth slightly open. Blood from Andreas Baader's head stains the floor. 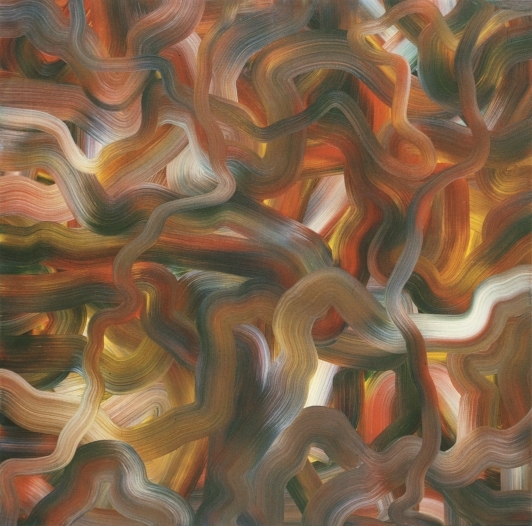 The weapon and the other objects lying scattered around Baader's head are difficult to discern in Richter's painting. 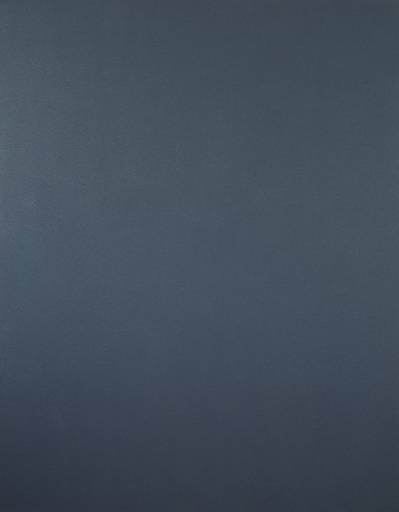 The terrorist's black trousers are in stark contrast to his pale face and the white objects near his head, which stand out from the grey floor. 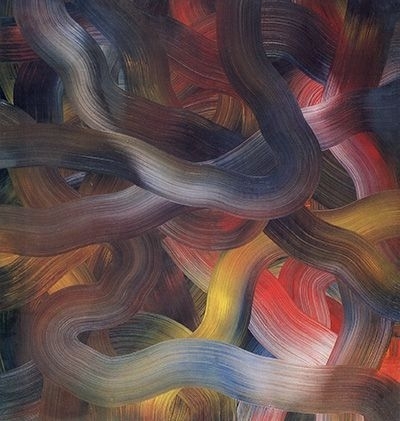 "Whereas the first painting is similar to the original photograph because of the selected detail and a moderate blur, in Man Shot Down 2 the stronger blurring causes Baader to appear otherworldly. The boundaries between figure and background are blurred. Baader's face can no longer be identified without any further information. The viewer's angle seems to have changed slightly, and despite greater enlargement, no additional information can be detected. "In both versions of the painting, the splayed-out arm in particular indicates the death of the depicted person, illustrating the loss of control of one's own limbs. This posture recalls, for example, depictions of the Pietà or Jacques-Louis David's history painting The Death of Marat. Such art historical references underline the role of death within the cycle of paintings. Talking of cold... I've been wondering what response art might be expected to offer, in the present extremely bizarre and confusing and scarily fateful political moment, if that's not too grand a name for this current farce of high-drama thrills and perils of Pauline and twitter absurdities and cube hotels and and legitimate fear and aporia at every turn. The poor old tired horse of liberty long gone well after after the barn door was locked, and We Who Are About To Update Our Facebook Page didn't want to know what was going on out in the stables, thanks very much! But sometimes, "just chill," doesn't quite do it. Hazen, we spoke at the same time. But you've said it better. Not the first time! Blindness by blanking, blindness by blinding, blindness by blurring, blindness by having a beautifully colourful pattern in front of our eyes. I am sitting in front of that pattern every day. A great poem, Tom. it's easy to play the game, yes, and with eyes wide open. “We Who Are About To Update Our Facebook Page.” So funny and yet so sad. As one tortured mercilessly for nigh onto a week by a feral SmartPhone mob, among whom number friends and loved ones, I too am aghast at the mindless addiction to electronica. It’s another form, literally, of blindness, despite all the “info” at hand. nothing much ever happens in a crowd.... ever. I love this poem. I feel as if sometimes I try to be blind. To say it takes effort is laughable. you will see nothing. . .
"Oh blinding light/ Oh light that blinds/ I cannot see/ Look out for me!" That fell within his scope. Upon his bare feet goes.